For the last 11 days, MBH Commodities’ Daily Sentiment Indicator (DSI) has recorded a 90% or higher bullish reading for the S&P500 index. This is the highest 10 day average ever recorded in the 19 year history of this indicator. Investors are now more optimistic towards this index than they were at tops in late 1987 or early 2000, which led to falls of 35% and 50%, respectively. The NASDAQ’s sentiment is also at extreme levels. For the last 10 days, an average of 92% of investors surveyed believe the NASDAQ will go higher. What makes this even more amazing is that the S&P500 and NASDAQ indexes are not making new highs. With extreme optimism levels not seen in over 19 years in these equity markets, it would be wise to prepare for a historic sell off. Since, sentiment surveys are only recent phenomena, we do not have measurements for manias in the 1830’s or 1920’s. However we do have another method that gives evidence as to the size of the sell off that we believe will soon occur. According to the Elliot Wave Principle, the first echo of a major top coincides with higher sentiment among market participants than at the initial peak. It is similar to an emotional gambler with a “double-down” mentality. Odds (or economic fundamentals) are against the gambler but emotion overrides rational probabilistic thinking. The “I have to make this back or my spouse is going to kill me” mentality. Even mutual fund managers are bound by it. “I have to make performance…or my investors are going to sell out of my fund.” This prevents participants from exiting the market even when extreme valuations occur. Today’s investors are guilty of this as well. They are “hoping” for stellar returns like those in the late 1990’s to make back their losses. Of course, odds are against them. The same market emotion fooled investors in the bear market peaks of 1968 and April of 1930. Most continued to hold through the following declines that lasted longer than a decade. How large could the future sell off be? 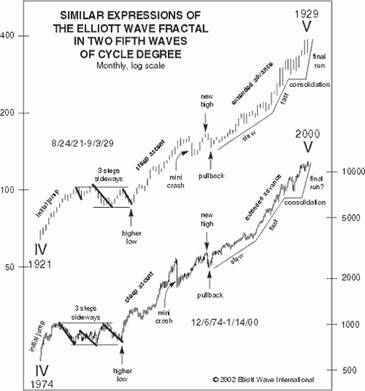 Robert Prechter used the chart below in his October edition of The Elliot Wave Theorist to compare the bounce in the S&P500 since 2002 to the rebound after the 1929 crash. This chart shows just the first two waves after each major peak. Most investors do not realize that the stock market moved in three phases after the 1929 peak: the initial crash, grinding bounce, and then the final downdraft. - F. Scott Fitzgerald’s “Babylon Revisited”, 1931. 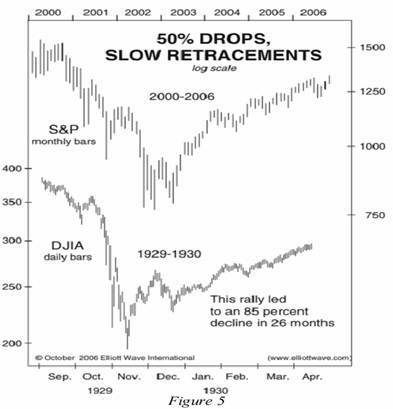 The down wave that started in April 1930 corresponded with three banking crises and a fall of 85% in the DJIA. It is unfortunate that our banking system has again been weakened, this time by unscrupulous mortgage lenders in the recent housing boom. We believe that we are apt to repeat history’s mistakes because ‘emotion to participate’ (greed) overrides rational thinking. 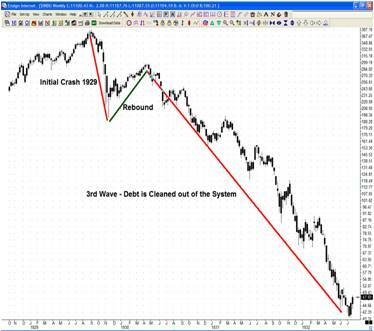 While most may initially dismiss the comparison to the beginnings of the Great Depression, they would also have trouble with the next chart also provided by Elliot Wave International in 2002. Unfortunately, as you can see, price action from 1974-2000 corresponds quite well with the ‘Roaring Twenties’. During the 1920’s, margin and credit expansion moved stocks to record levels. 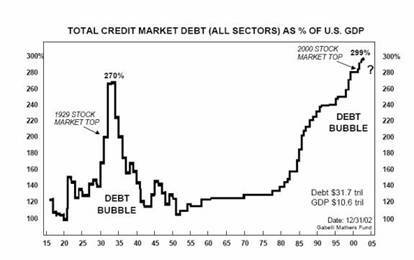 Similarly, our boom has been based on credit, especially consumer debt. 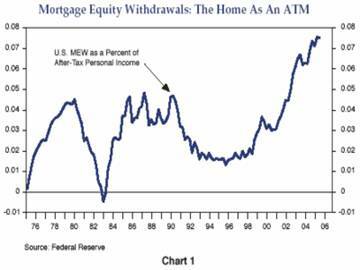 More recently, home equity extraction (shown in chart below) and loose mortgage lending practices have added fuel to the boom. As a result, financial institutions will come under severe strains as the credit bubble bursts. The rise of mortgage defaults will signal the beginning of this deflationary spiral. Unfortunately, interest rate markets are setting up homeowners for this exact scenario. Recently, leveraged speculators have piled into long term bonds driving down interest rates. The Commitment of Traders reports that the bet by ‘Large Speculators’ in the decline in interest rates is the greatest in over 10 years of data. Historically, ‘Large Speculators’ extreme leveraged positions have led to losses against better capitalized ‘Commercial Hedgers.’ With sentiment also at high levels in the 10 Year Treasury Note market (88.7% bullish- 10 day DSI, MBH Commodities), history implies that the peak in bonds is near or already has occurred and higher rates will be in store for at least the next six months. Higher rates will prevent many from refinancing out of their adjustable rate mortgages. Reports from Fannie Mae state that over $1 trillion dollars in mortgages will reset at higher rates in 2007. Many U.S. homeowners, whose savings rate is negative, will not be able to withstand this financial pressure. As they default, the third wave and credit crunch will begin. Our analysis shows that owning stocks, mutual funds, real estate, and long term bonds will lead to losses in the future. Given this outlook, holding 3 month U.S. Treasury Bills directly in your name at a financially healthy institution is currently the best option for investors. If short-term interest rates climb, investors will benefit from buying new T-bills at higher rates every 3 months. However, if asset values fall as the credit crunch begins, total principal will be protected by the full faith and credit of the United States Federal Government. At Lamont Trading Advisors, Inc. we specialize in the preservation of wealth. Please contact us to open your U.S. Treasury Bill account and protect your portfolio against volatility.